September 30th, 2016: LocalCircles, India’s largest citizen engagement platform started creating city level communities to monitor Swachh Bharat Mission in October 2014. 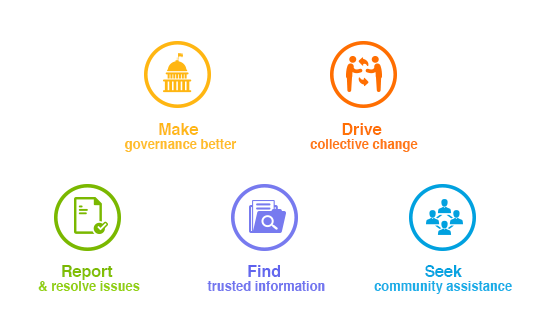 Over 350,000 citizens across more than 60 cities are now part of various citizen communities. These local communities work extensively at city level to discuss and engage with local administration. On the completion of two years of Swachh Bharat mission a massive poll covering 14 parameters was carried out by LocalCircles. The objective of the survey was to track the progress of the mission at city, state and national level. One of primary objective to keep cities clean is to make citizens aware about cleanliness and citizens response to it. This is seen as part of the civic sense of the citizens. The survey shows that 40 % citizens believe that civic sense has improved as a result of the Swachh Bharat’s campaign while 54 % believe it has not improved, where as 6 % were undecided. The basic question about whether cleanliness has changed in their city and neighbourhood as a result of two years of Swachh Bharat. 34 % of citizens said cleanliness is slightly better (0-10% better), 18% said its better (10-30% improvement), another 9 % citizens said that it is significantly better while 39 % citizens said that there has been no impact. In total 61% of the citizens surveyed found some improvement in cleanliness as compared to two years ago. After two years the biggest area of concern remains the involvement of the Municipal bodies with Swachh Bharat. 41% citizens believe lack of municipal delivery and enforcement is the biggest bottleneck to achieving cleaner neighbourhoods and cities. After two years, only 12% citizens say their municipal corporation is effectively conducting fogging, taking care of water bodies to control vector borne diseases. Only 23% believe their municipality has become more responsive to complaints on garbage collection, waste disposal and street cleaning. Only 18% citizens believe their municipality is engaged in driving cleanliness and civic sense awareness initiatives on the ground. If the city level data is added to the state level we get a comparative picture of 19 states covered by the survey. There are 4 states where citizens say, there has been visible improvement (30% or more improvement in cleanliness). While 11 states show marginal improvement in cleanliness in the range of 10-30%. The remaining 4 states according to citizens have seen no impact of Swachh Bharat. The top four states performing on Swachh Bharat are Andhra Pradesh, Madhya Pradesh, Gujarat, and Maharashtra. The states showing marginal improvement of 10-30% are Tamil Nadu, Kerala, Karnataka, Telangana, Goa, West Bengal, Haryana, Uttarakhand, Orissa, Assam and Rajasthan. The states showing no impact of Swachh Bharat according to citizens include Delhi, Uttar Pradesh, Punjab and Bihar. (The map below captures the state level performance). There are also some cities that have shown visible improvement despite their state only showing marginal improvement. These include cities like Belgaum, Mangalore, Udaipur, Coimbatore, Madurai, Hyderabad, Dehradun and Kolkata. 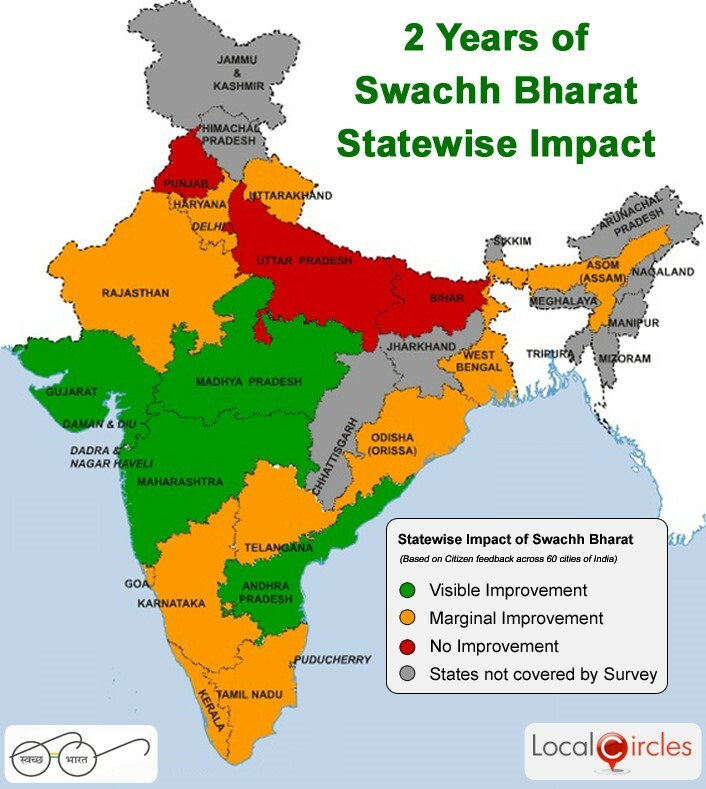 The national survey on two years of Swachh Bharat was conducted in the Swachh Bharat National Circle to gauge the impact and performance of Swachh Bharat in a transparent manner. The objective was to understand what’s working and where efforts need to be put in going forward. On an average, over 15,000 citizens participated in each question with over 250,000 citizens participated in the overall survey thereby making it the largest civic survey of its kind. The local city level surveys were done in the respective Swachh Bharat local circles in 60 cities across India. Approximately 60% of the citizens participated in both the national survey and the city survey while 40% of the citizens were unique to the city survey. Approximately 62% of respondents were males while 38% were females. The participants were 42% from Tier 1 cities, 30% from Tier 2 cities and 28% from Tier 3 Cities and Rural areas.